When you click on the Subscribers tab, you can access the entire contact list. Search terms help you limit this list (or any other list) to only the contacts that match your requirements. Type something like "@yahoo.com" or "Smith" and search just what you've entered. Or! To search for info beyond just email and name, enter a "tag" followed by the value you want to match. For example, enter "City:Chicago"
Click the box next to Email and notice that GoDaddy Email Marketing puts a check mark next to all contacts (visible on this page only) from your search. In case you have a long list of matching contacts, that spans multiple pages, click the option to: "Select _ people?" from your search so that you can get the entire set. Voilà! You've done it! You've selected your entire search results. But wait, what can you do with this selection of contacts? You can either export them to a CSV or XLS file -- or add them into a new or existing list. Let's say you want to move every contact that has some piece of information in common to their own list. For example, everyone with a Yahoo email or maybe from the same City. After you've searched and selected the matches, click the Add to button in the top right, and choose an existing list from the options. This will add your selection to this list. 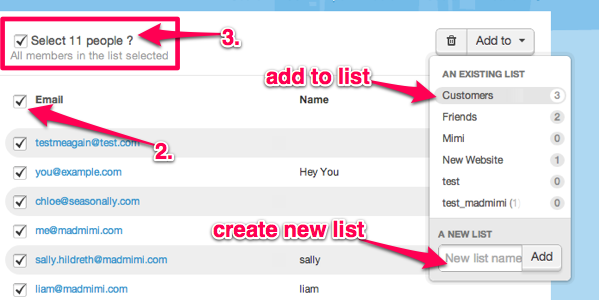 Or, type a new list into the field at the bottom, to create a brand new one, for just these selected contacts. If you'd rather export the list, click the Export button, and then select if you'd like the export in a CSV format, or XLS format. Then check your email for the download link, and right-click to download the exported file.